Today we raced in Waterside D, the last of the Waterside Series and the last milestone in our training before DW itself in two weeks time. 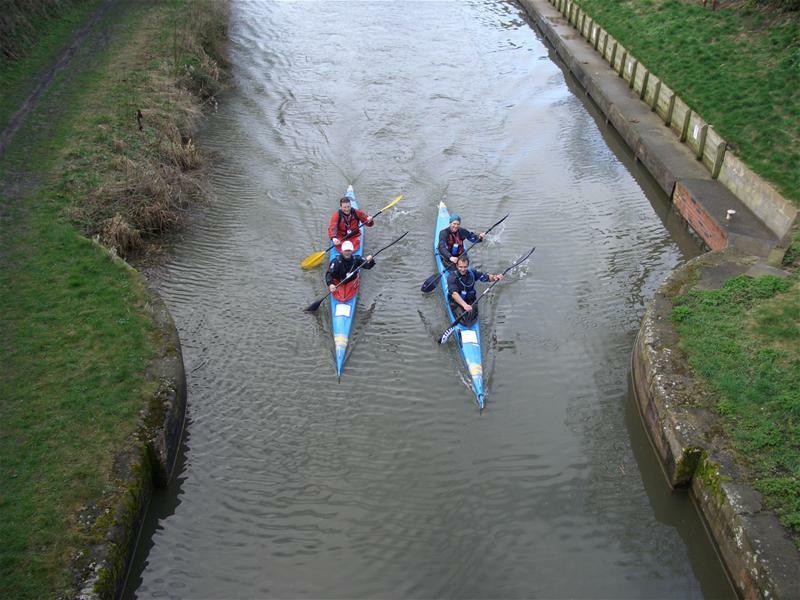 The race is 34.3 miles from Devizes to Newbury with 35 portages including the dreaded Crofton Flight (seven locks too close together to be worth paddling and therefore portaged in one go - just over a mile). After finding Waterside C so tough two weeks ago I was more than a little afraid of today's race but it went well and I feel very much more confident about DW now than I did then. We finished 21st out of 42 starters in 6:33:48, Mattias and John were just ahead of us in 20th place with a time of 6:32:05. In the last race we were competing with each other from the off and this led to Julien and I getting quite demoralised as the others disappeared into the distance. 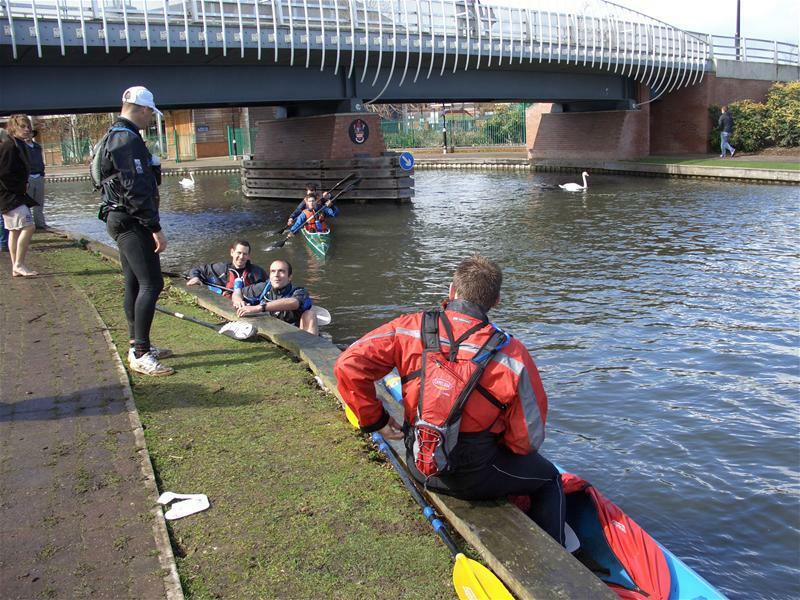 This time we agreed to paddle together collaboratively, as we plan to on DW, and this approach certainly raised my moral and I think helped us all. The other big difference from last time was support. For the first time we had a support crew, Matt's girlfriend, Yolanda, who did an amazing job single handed. She must have met us half a dozen times during the day, replenishing our food and drinks and cheering us on. I had not appreciated what a boost it is to see a friendly face waiting for you at a portage ready with fresh supplies. I can see that we will be deeply indebted to our support crew as we already are to Yolanda. The conditions also helped us today with a strong tailwind blowing all day, the weather was a mixture of sunshine and showers - neither too hot nor too cold. If it is similar in a fortnight's time we will be happy. 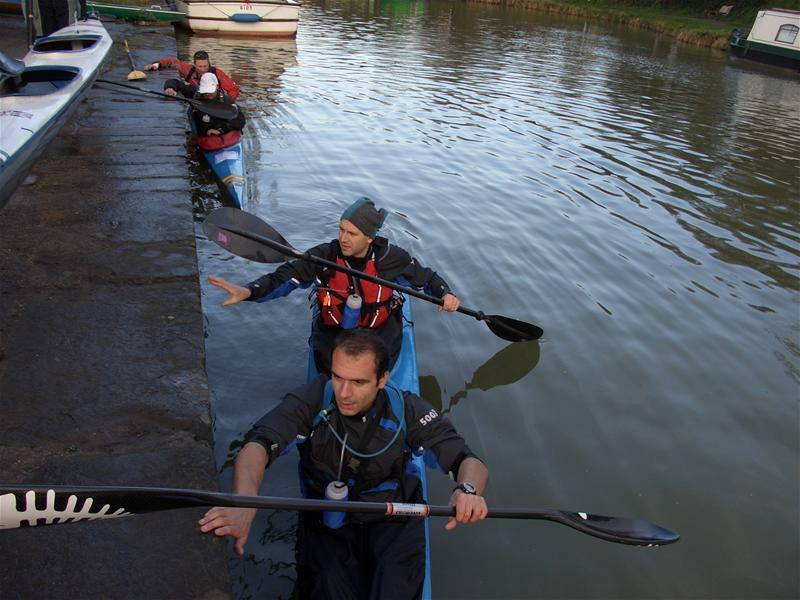 The race was not totally without incident: Matt sampled the Kennet & Avon canal at about two thirds distance when he was a bit over enthusiastic embarking after a slippery portage. After that we kept the pace up to keep him warm. Thanks to Yolanda for the photos. Video clips coming soon. Well done on your Watersdide D paddle. Given the pace you guys have been going in practice - what is your target time? Given that do you know when you will start? Doing DW for the first time this year and we have been paddling at a similar pace to you so would be interesting to understand 'race strategy' re timings etc. Hi David, race strategy and timing is something we have yet to finalise. Reading Brian Greenaway's book about the race, he suggests that multiplying your Waterside D time by three and a half gives a good rule of thumb guide to your DW time, which would be about 23 hours for us. That would mean starting 20 hours before high tide at Teddington (05:11), so a start time of 09:11 on Saturday morning in Devizes. Greenaway also says that if you work out your average speed on the canal you can expect to add 0.5 mph on the river if there is moderate flow and 1mph on the Tideway. Did you do the Watersides? Where have you been training? Mainly training on the Thames and River Wey. Did Thameside 2 in 3hr 20. Did Royal K2 (Runnymede to Teddington) in 3hr. Our training pace on the Wey Canal is just over 5mph for approx 20 miles. We were thinking of starting at 7.00am giving us the best possible chance of making the high tide window. If we are early to Teddington (which I doubt we will be) then I guess we just take a hit on our overall finish time.